Though the quote above is quite dark, I have to say I love the imagery of it. And even though I am a generally happy person, I do understand and relate to having days where there’s a hollow place inside of you. Though a little dark, I think most people have moments where we really relate to this. 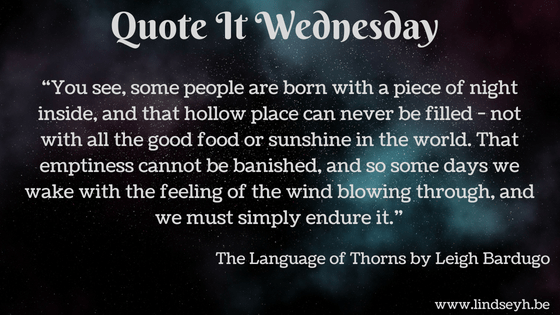 It also perfectly showcases the gorgeous writing in The Language of Thorns by Leigh Bardugo: whimsical, yet dark. WHAT DO YOU THINK OF THIS QUOTE? Do you love it or is it a bit too dark? It is dark and a little sad, but I like it. It’s beautifully written! I love this quote! And I guess, to some extent, I can relate to it as well. Leigh’s writing is beautiful! Aimee (Aimee, Always) recently posted…How To Make a Blogging Schedule That Works For You, AKA I Admit to Mood Blogging + Free Organization Spreadsheet! Gah! How have I not READ this book yet???? I adore Bardugo and I love this quote. Beautiful. I hope you’ll get to read this soon and you’ll love it just as much as I did! It’s filled with tons of beautiful quotes like this.